The residents of Jesmond are going to be fuming about this review, I’m afraid. I’m really sorry everyone, but I’m blowing the gaff on your secret treasure. I know you’ve been keeping it to yourselves, this precious hidden gem, and I don’t blame you, for it’s quite special. But this is a local restaurant that deserves to be shouted about, because the cooking here is very good indeed. 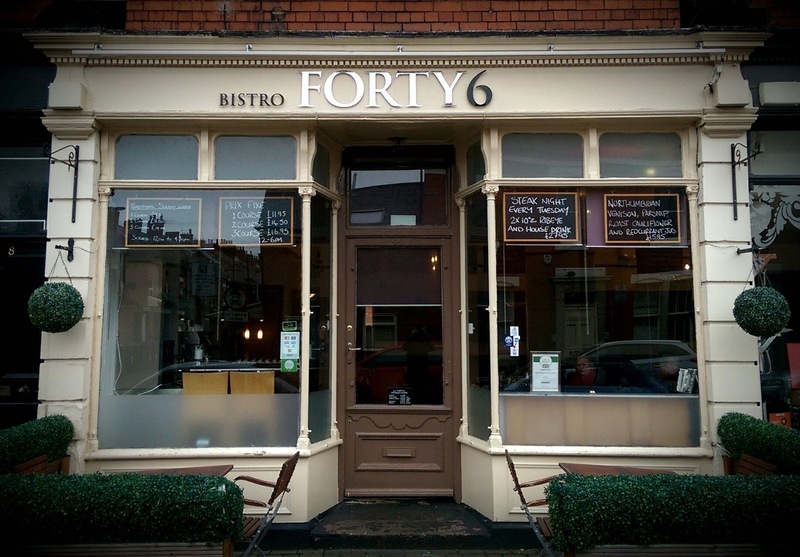 There are precious few good bistros in the region, and this one is up with the best. It looks nondescript enough, certainly compared to the glitzy, noisy joints round the corner on Osborne Road. 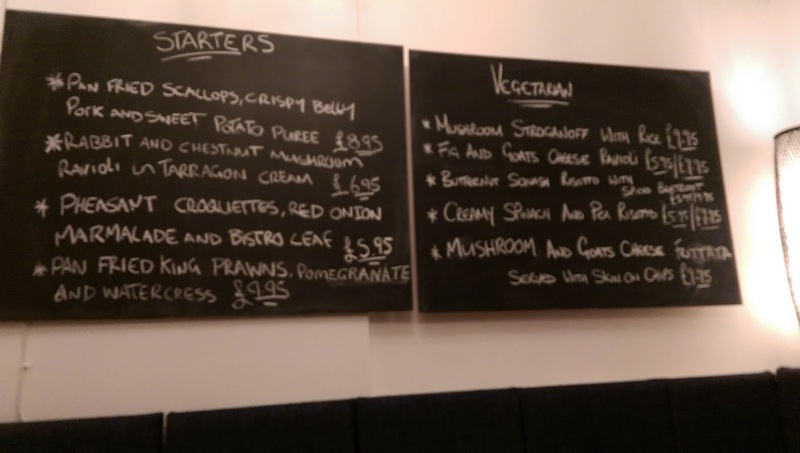 It’s an informal little bistro in a row of shops, small and comfortable, with chalked menu boards all round the room. 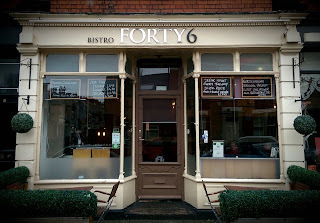 Outside they advertise Tuesday Steak Night and a 12-6pm prix fixe (£16.95 for 3 courses). At first we weren’t too optimistic. There were so many “specials” on the boards, as well as a printed menu, that we suspected a small kitchen would be far too stretched to do justice to so many dishes. There was seafood thermidor with homemade squid ink linguine, mackerel with salt-baked golden beets, mussels, venison, chicken with saffron couscous, steaks, lamb, seabass, duck, rabbit — a really big menu for such a small place and a limited clientele. We feared mediocrity, and ordered a decent bottle of Languedoc, just in case. We were so wrong. 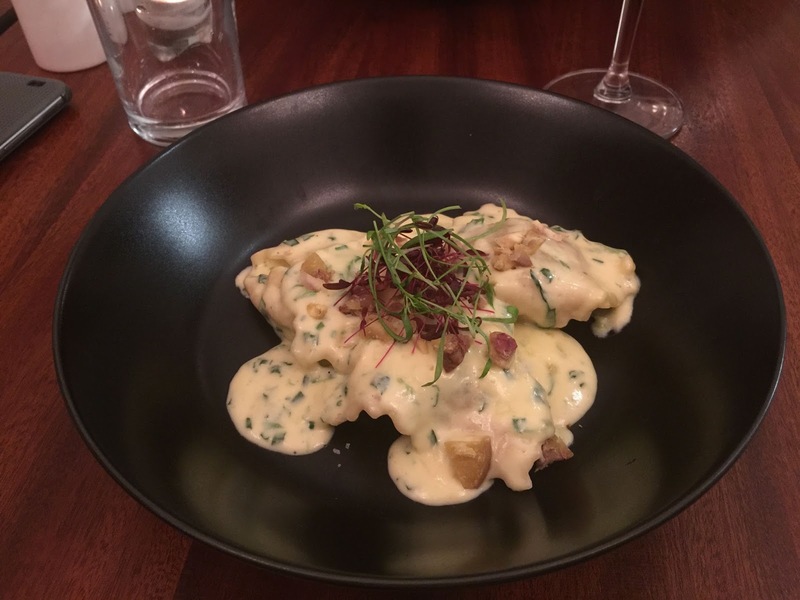 From rabbit and chestnut mushroom ravioli (£6.95), moist, with great homemade pasta cloaked in a creamy tarragon sauce, to expertly prepared king scallops with crispy belly pork and sweet potato purée (£8.95), our starters were excellent. 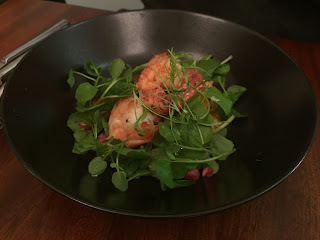 I had pan-fried King prawns, pomegranate and watercress. The prawns were big, juicy, and — somehow aromatic. What was the mystery ingredient? I savoured it, located a distant taste of aniseed, saw no clue on the prawn itself, and confidently proclaimed: Pernod. I gave myself a little high-five, which was, in retrospect, more than a little pathetic. For I was also wrong. A question sent to the kitchen returned with the answer: micro fennel shoots, so micro as to be almost undetectable, but offering the dish mini taste bombs of anise. It was only a humble prawn salad, but this touch rendered it delicious, with the freshest peppery watercress and little seeds of pomegranate. This was a delightful collection of starters. But then a large party of birthday celebrators joined the restaurant. We feared standards might fall with the kitchen under pressure. Aside from two tiny errors, we had nothing to fear. Coley (£14.95), pan-fried then baked, was simple enough and perfectly cooked, sitting on its bed of braised puy lentils, but a fabulous seafood cream sauce was intensely nautical, with sprinklings of crab and big plump Shetland mussels. Mrs Diner was delighted with her rib-eye steak, which had been seasoned with Viking smoked salt. This is the magic yellow gold dust extracted from seawater in Norway by wood-smoke, sending all who taste it straight to Valhalla. 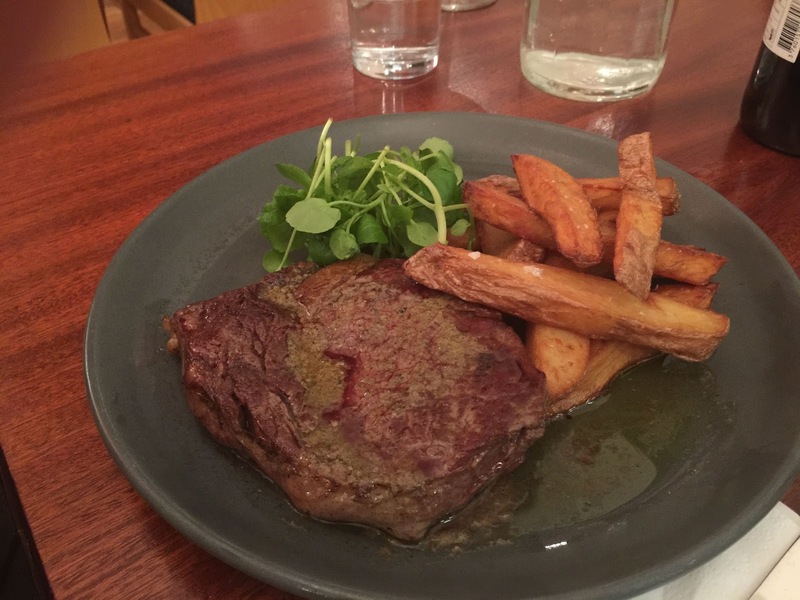 The steak was consequently divine, with an intense scent of Old Norsemen. 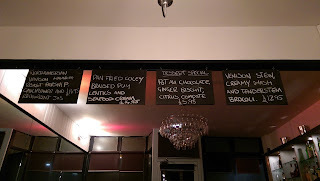 The hand-cut chips were pretty good too, and the whole dish a bargain at £16.95. I also struck gold with my venison haunch special (actually, it was silver-gilt, for it was slightly over but with excellent taste and texture nonetheless — I blamed the overcooking on the birthday party). The venison, chef/owner Max Gott told us later, was local and butchered in-house. 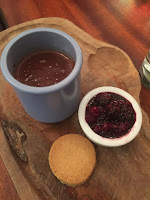 It had an earthiness about it, with a intense, well-reduced jus, scented with redcurrant. Gott, who has is a pretty divine name for any chef, has brought a passion and flair to this place. The menu couldn’t be more seasonal, which is important, but what I found impressive was that he was really pushing his little kitchen to the limit. Many chefs would have taken the easy route, but everything, from the butchering, to the proper sauces, was in-house, which made it all personal and special. And it all worked. 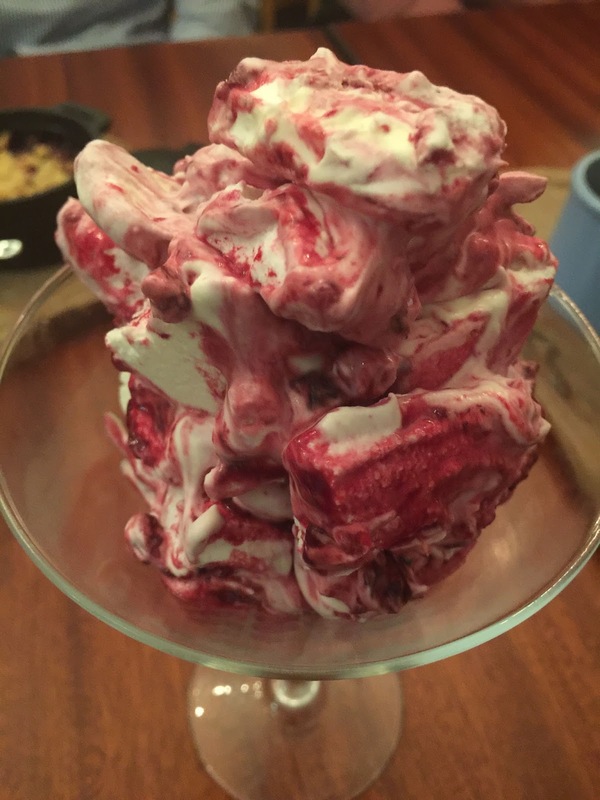 Aside from the very slightly overdone venison, the only other blip happened during dessert. 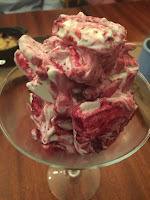 We all loved the spectacularly good Eton Mess, and fought over a little pot of strong dark chocolate goo. However, a nicely tart wild berry crumble was accompanied by a custard was a touch curdled. 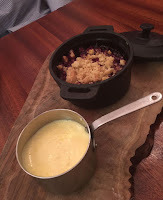 Sure, it was curdled custard, but it was homemade, as was everything else, and I blamed it on the birthday party. Fortunately for Max, this blog doesn't have a symbol for three-quarters of a star, so I’ve rounded up the score to a big fat five. An impressive achievement for a two-man team. I wondered where Max had learned his trade. He said he’d worked at Louis, the restaurant on Osborne Road that seesawed itself through good times and bad in the last decade (it closed early last year). One of its better periods coincided with my first review of it, five years ago. That was when Max Gott was working in the kitchen. 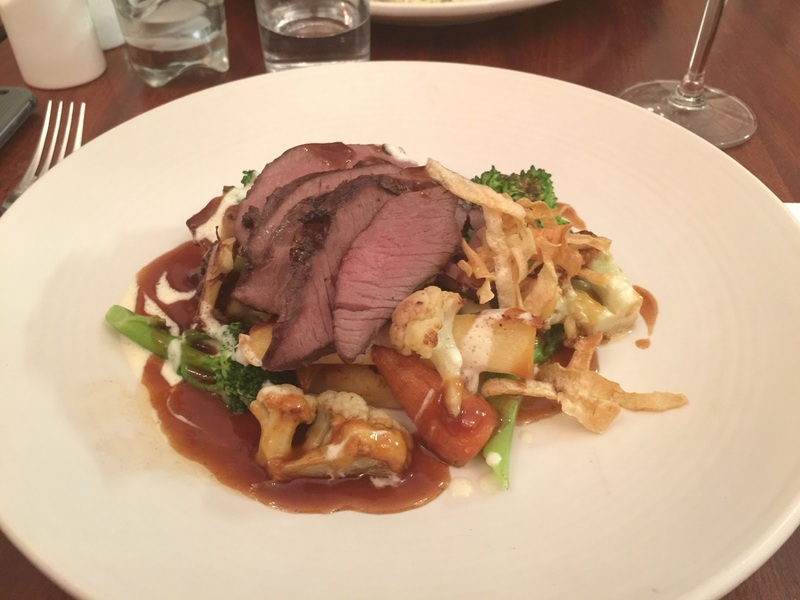 Jesmond, you are lucky to have Max, and his restaurant. I hope you don’t mind now sharing them with the rest of the region. I wonder whether the ownership or staff have changed. We went about 2 years ago and had an awful meal. 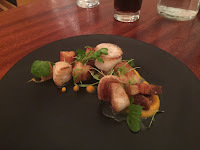 Undercooked poussin, pork belly with gelatinous rather than rendered and crispy skin, delayed and average service. Never went back...maybe we will try it again in view of this review. Hi . I can confirm the place has been taken over by 2 brothers recently and it has vastly improved ! That cake is awesome, Holly! The hearts are so cute and it really does look delicious. carol pies Got to pin this one, for sure. Have a beautiful weekend! 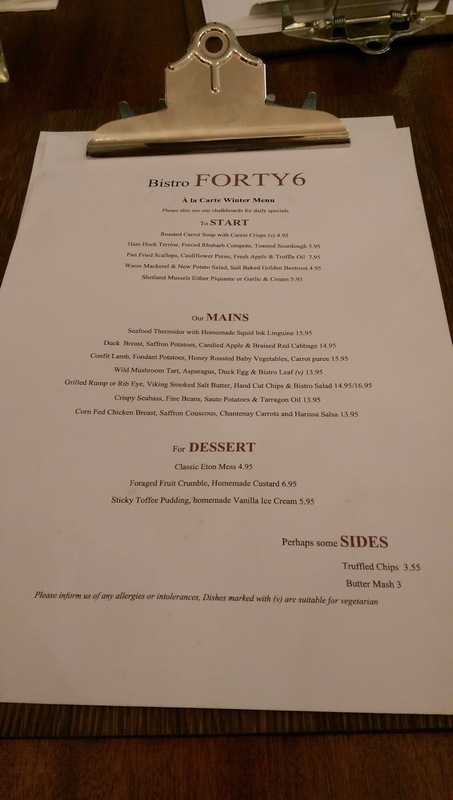 My wife asked me to choose a Newcastle restaurant for my 55th birthday. There was no hesitation, Bistro Forty Six. 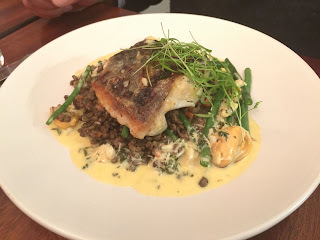 Great food from passionate folk. Can't go wrong.